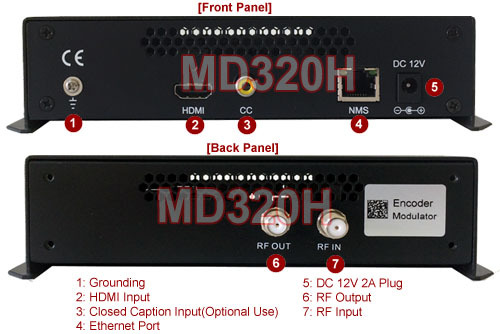 This professional HDMI to RF modulator is designed for converting HDMI video played from computer, blu-ray player, set top box or HD security camera to a digital TV channel of user choice for broadcasting and distribution. This HD modulator is an universal RF modulator for worldwide digital TV system. It supports modulation into terrestrial digital TV channel frequencies for ATSC, DVB-T, DVB-C, DMBT and ISDB-T TV signals. Its programmable TV channel selection allows users to select any desired TV channel frequency for its RF output. This HD modulator can be used as a standalone unit or multiple modulators chained together for creating more private digital TV channels. No coax combiner needed. Ideal and cost effective tool for creating your own advertising or information TV channel through using this HD modulator. This unit is built with 1 HDMI input, 1 RF input, 1 closed caption input with 1 RF coax output. 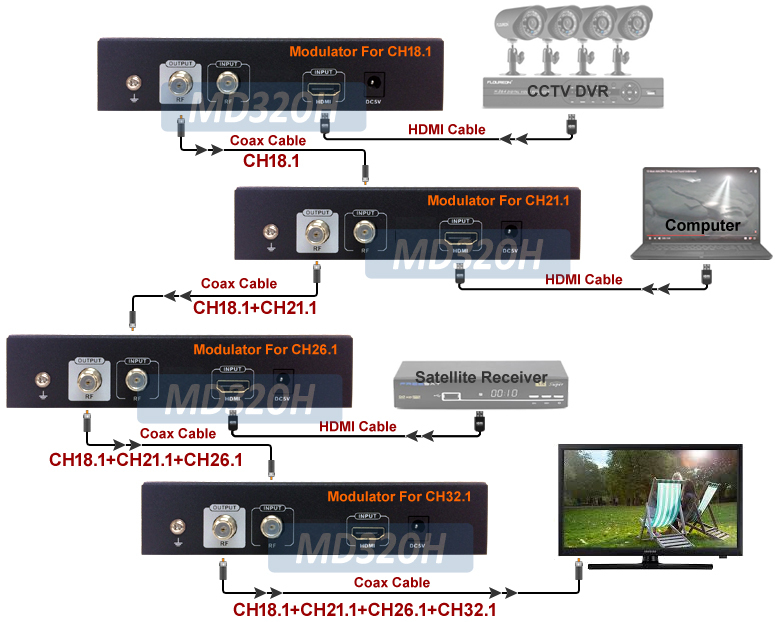 This HD modulator can also accept closed caption signal from its RCA input and encode them into its RF output. Its RF input allows this modulator to accept RF output from another HD modulator, antenna or set top box and combine with its own modulated channel into one coax TV signal. 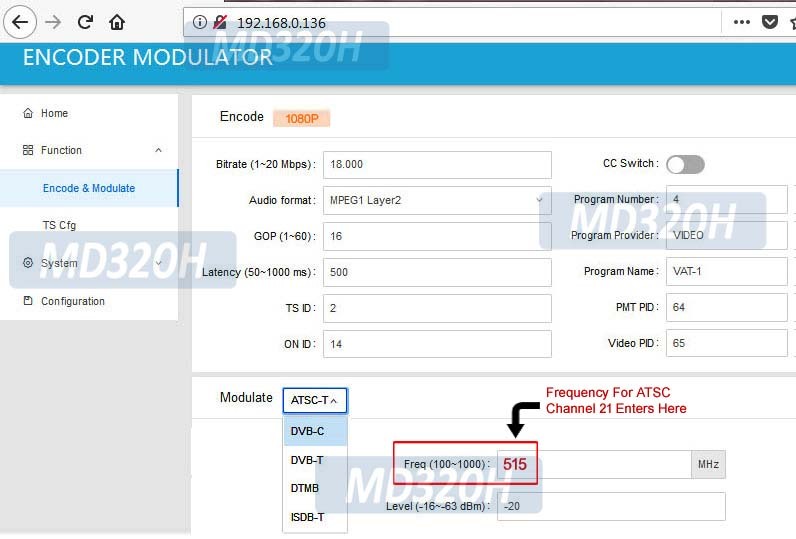 This universal HD modulator is easily configured. Users can access and control the HD modulator through using a web browser when directly connected with a PC using Ethernet cable. Its web control panel provides all the detailed control functions such as DTV system selection (ATSC, DVB-T, DVB-C, DMBT, ISDB-T), TV channel frequency, channel name and so on. This HD Modulator supports selectable modulation into world-wide terrestrial TV channel frequency for ATSC, DVB-T, DVB-C, DMBT and ISDB-T TV signals. After the cabling hookup and TV channel output setup, users could use the TV remote or IR remote of the digital aerial TV receiver box to tune into the new channels just created and see their HD video or camera screen showing on the HDTV screen. 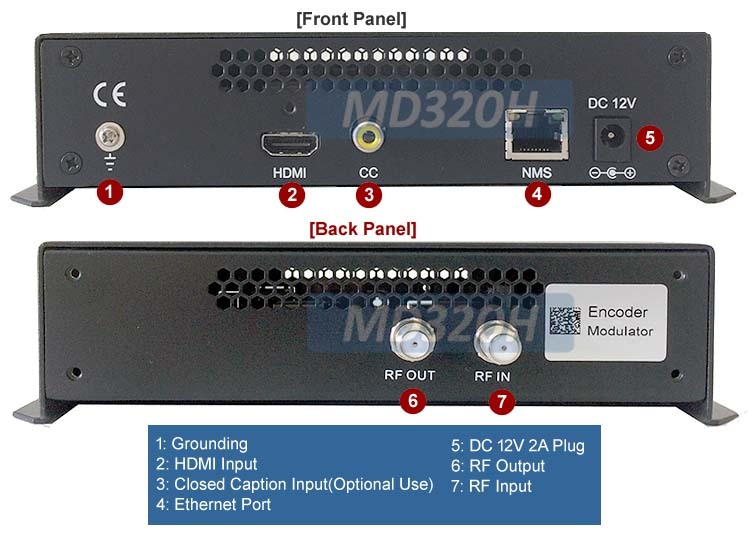 This HDMI to RF digital modulator adopts MPEG2 for HD video encoding. The output RF TV signal quality will follow the original HDMI input quality. Maximum modulation quality up to 1080p. The unit also supports MPEG1 digital audio AC3, AAC and PCM audio encoding into digital RF output. This digital HDMI modulator can be used as a standalone unit or cascading with other units together. 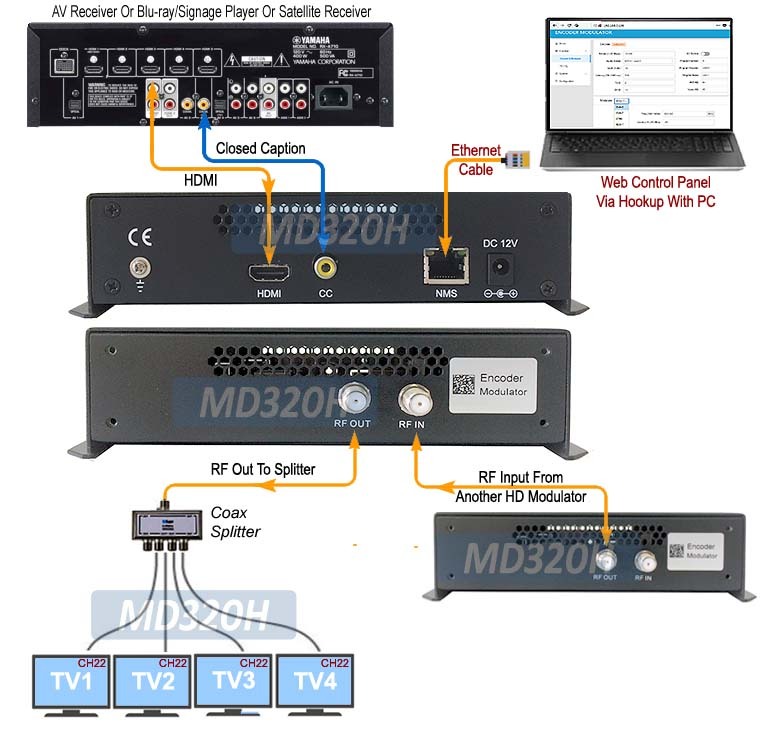 Multiple of these digital modulators can be linked together by feeding the modulated RF output from the first unit into the RF input of the next HD modulator so more private digital TV channels can be created and combined together in one RF output for large-scale HDTV distribution. Users can also add more of these RF modulators for modulating more HD videos into more digital TV channels and combined them in one coax cable run or using the daisy chain hookup for cascading as described earlier for large-scale private TV channel distribution. This HDMI to RF modulator can also be combined with our digital TV tuner box, model DTV103, so they can be used as a HDMI video/audio over coax cable extender kit for HD content distribution purpose. Education/Training: build private TV channels for broadcasting the computer screen or digital media content prepared by teacher or instructor for classrooms. 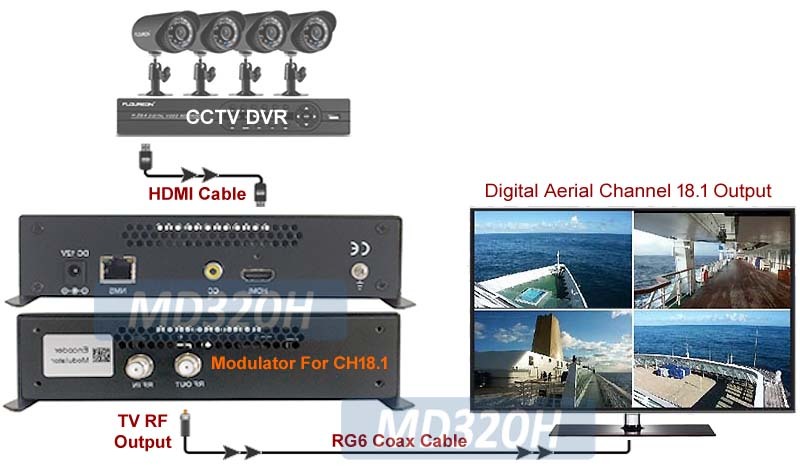 Any TV connected in the same coax cable can watch the custom-made TV channel created by using this HD RF modulator. Digital Signage: converting digital media content played from DVD player or any digital media player into a commercial TV channel and transmitted over multiple TV displays in public place for advertisement or signage purpose. Retail Store Advertising: retail store owners can use TVs to play their own video ads on TVs through single coax cable run inside the retail store. No internet or network connection needed. Professional-grade HDMI to RF digital modulator/encoder with world-wide terrestrial TV channel output. Ideal and cost effective tool for creating your own advertising, training or information TV channel through this modulator. All-in-one modulation with MPEG2 video encoding to convert HDMI feed into selectable digital TV channel. The output RF TV signal quality will follow the original HDMI input quality. Maximum modulation quality up to 1080p. Support worldwide digital aerial TV systems including ATSC, DVB-T, DVB-C, DMBT and ISDB-T. Distributing HDMI video via digital HD aerial channel frequency to all HDTV sets connected through the same coax cables. This RF modulator unit works with all HDMI sources and full HDCP compliance. Supports 1 digital RF input for cascading purpose. Easy configuration through using a web browser when running a direct Ethernet cable link with a PC. Web-based control panel provides all the detailed control functions such as DTV system selection, TV channel frequency, channel name, etc. Supports MPEG1 digital audio AC3, AAC and PCM audio encoding into digital RF output. Supports closed caption input via RCA format. Used as a standalone unit or multiple modulators chained together for creating more private TV channels. Its RF TV channel output can be decoded by any digital HD TV tuner or digital aerial TV receiver, DTV converter. Programmable TV channel output provides flexibility in altering TV channel line-ups and instant replacement of existing TV channels. Users can add more of these RF modulators at any time for more video sources to be modulated into more TV channels and combined in same coax cable run for distribution. Powerful 100dB RF output sufficient for long cable transmission up to 1200 meters with no loss of picture and sound. Retail stores or restaurants can play their custom-made video ad on TVs through single coax cable run. No internet or network connection needed. Corporate or schools can can use TV pools to play their in-house signage or information content through coax cable run. No internet or network connection needed. Transmitting audio/video over coax cable offers greater transmission range at much lower cost than the typical balun or Cat5 extender solution. Video and audio signals from CCTV surveillance camera can be presented on any desired digital TV channel.